Windows 10 Pro is just a click away, too. We go hands on with Microsoft's Windows 10 S and one of its inexpensive partner laptops, the Dell Latitude 11 EDU. Dell’s Latitude 11 EDU 360 3189 is one of the sturdy, affordable Windows 10 S laptops joining Microsoft’s campaign to nudge Chromebooks out of the classroom. You don’t have to be a student or a parent to understand the software giant’s desire to nurture a new generation of Windows users. When we tried it at Microsoft’s education-focused event May 2 in New York, we could see how it might have a fighting chance. The $299 Latitude 11 EDU has company: Other hardware partners include HP, Samsung, Toshiba, and Acer. It’s worth noting that all these companies already sell Chromebooks, so they know a lot about the competition. Most of these models are designed to be your kids’ first Windows machine, sticking with them all the way through high school on Windows 10 S. Over time, they’ll graduate to something a bit more powerful (and expensive), like a Surface Laptop. 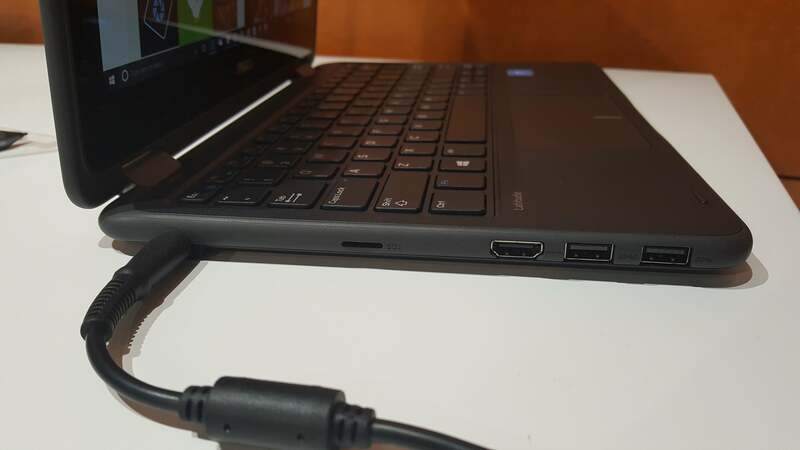 Two USB ports, an SD card slot, and HDMI out mean that the Dell Latitude has more port expansion options than the Surface Laptop, by a long shot. Though I spent the majority of my time with the EDU 3150, I also tried out several of its competitors briefly: the $299 HP ProBook x360 11 G1 EE, the Toshiba Altair-ME, and the Samsung Notebook M. (Prices weren’t available for the Toshiba and Samsung machines.) All had similar components and seemed to perform somewhat similarly. The EDU 3150’s basic specs mirror that of a similarly priced Chromebook: a Celeron processor, 4GB of RAM, 64GB of flash storage, and a 11.6-inch, 1366x768 display. At least in the demonstration model, the laptop was beefy enough to run a few core apps, such as OneNote, and FluidMath, a Windows app that used animation to help illustrate math problems. Connecting to the Internet and surfing the web using Edge also worked adequately. The Latitude’s plastic shell can withstand moderate drops. Like education-focused Chromebooks, the EDU 3150 and its cohort are designed to be tough. Partner executives repeatedly dropped them from waist height or so onto carpet to show off their durability. Another education notebook, the Acer TravelMate B118, includes a waterproof keyboard that withstood a dousing by an entire glass of water. 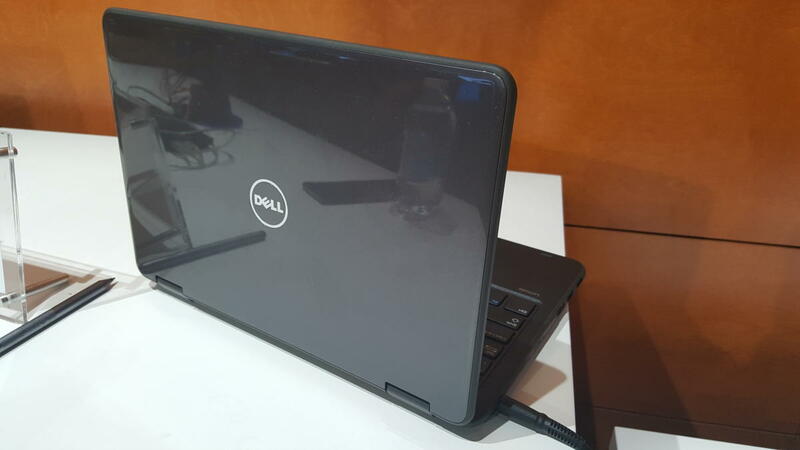 Also like many Chromebooks, unfortunately, Dell’s laptop had some rougher spots. I found the trackpad rather tough to click, and the keyboard keys seemed stiff. The boxy plastic frame felt sturdy, however, and the edges of the screen were protected by a thick plastic bezel. Durability’s the key here, and the Latitude definitely conveyed that message. Microsoft hopes school IT administrators will appreciate the manageability features of the Windows 10 S operating system, such as the ability to create custom images from a tool, save them to a USB stick, and provision a classroom’s worth of laptops in a matter of minutes. I didn’t have a chance to try that, though Microsoft executives said the ease and time for provisioning a classroom is comparable to what you’d experience with Chromebooks. If you’re looking for an explanation of how Windows 10 S differs from Windows 10, you won’t find it here. From a user experience, I could find no difference—except the fact that you can only download apps from the Windows Store. If you try to load an app that’s not approved—say, Google Chrome or Valve’s Steam games distribution tool—a popup will bar your path. 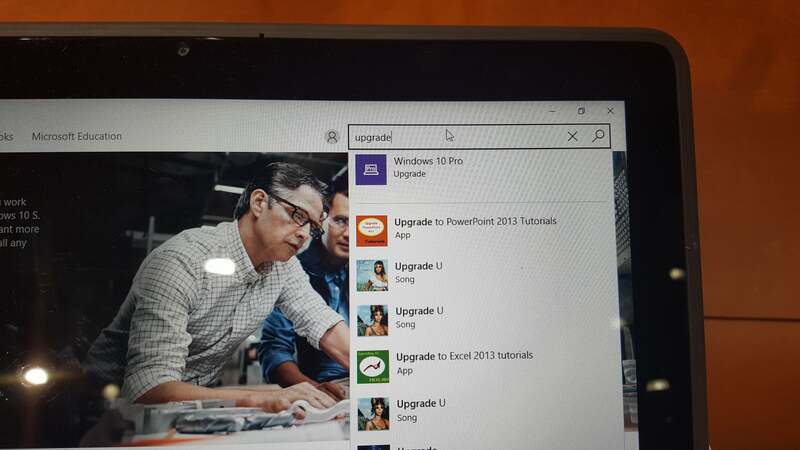 Want to upgrade to Windows 10 Pro? You can do it via the Windows Store. That does not mean all is lost, however, or that the laptops are limited by default. Microsoft executives told me that a user can upgrade to Windows 10 Pro directly from the Windows Store—and they can do it for free. A cloud-based version of Office for Education is also available for free, meaning a student will have access to common apps like Word or PowerPoint as long as the machine is joined to an education domain.